Makes: Makes one 9-inch cheesecake; serves 12. 2To make the crust, combine the graham crumbs, butter and sugar and press the mixture into the bottom of an ungreased 9-inch springform pan. Bake the crust for 10 minutes, then set it aside. Turn the oven up to 425°F. 3In a large bowl, beat the cream cheese with an electric mixer until it’s smooth. Add the sugar, flour, lemon zest, lemon juice and vanilla and beat it again, just until it’s smooth. Add the eggs one at a time, beating well after each addition. Pour the batter over the crust. 4Bake the cheesecake for 10 minutes, then reduce the heat to 250°F and continue to bake the cheesecake for another 30-35 minutes. 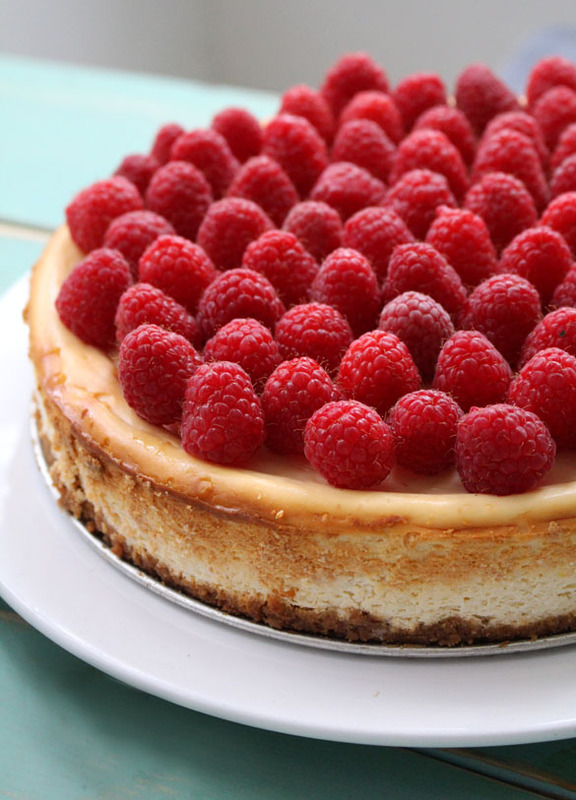 (If you have trouble with the top of your cheesecakes cracking, spray some water inside the oven with a spray bottle before you put your cheesecake in to keep the oven humid inside as the cake bakes.) You can tell when the cheesecake is done when it’s barely firm around the edges and the center is just slightly jiggly - it will firm up as it cools. Immediately run a thin knife around the edge to loosen it from the pan, but allow it to cool completely and then refrigerate it for at least an hour before you remove the sides of the springform pan. Once chilled top with raspberries, sitting them upright and close together.